Mario Party 10 is a game for the Wii U. It is the tenth home console installment in the Mario Party series, and features many reused gameplay elements from its predecessor. The game features a standard Party Mode (similar in gameplay to the Party Mode from Mario Party 9), and a new mode called Bowser Party, in which one player controls Bowser using the GamePad, and exclusive minigames can be played. Mini Stars return in normal party, as well as vehicles in all modes. The game is also compatible with amiibo. Mario Party 10 offers three basic modes of play: Mario Party, Bowser Party, and amiibo Party each with their own unique styles of play. Other modes include Minigames and Toad's Room - the former has players simply playing minigames while the latter is where players can access a shop, a photo booth, and other items. Mario Party is the central mode of Mario Party 10. Similar to Mario Party 9, players compete to get the most Mini Stars while traveling through the board on one vehicle. Characters move around in vehicles taking turns being the captain and rolling the dice. A brand new feature is that Bowser is locked in the GamePad with dice numbers. Each time a Dice Block is rolled, the lock of the corresponding number will be unlocked (there are six locks, one for each number on the die). The player who unlocks the last lock loses half of their Mini Stars and Bowser will add Bowser Spaces on the board. If Bowser isn't free by the time the "Homestretch!" space is reached, he will be sealed away and his son will add Bowser Jr. Spaces instead. When in Chaos Castle, Yellow Toad takes Bowser's place and gives the player Mini Stars for freeing him. Also, item shops return, this time in the form of Toad Houses, where a Special Dice Block is given to all players. Bowser Party is a new mode of gameplay featuring Bowser. One player controls Bowser using the GamePad, and up to four others use Wii Remotes to play against him as Team Mario. Mini Stars are replaced by Hearts, and the goal of Bowser is to deplete all the other players' hearts, while the goal of the other players is to make it to the Super Star at the end of the course with at least one heart between them. Each member of Team Mario rolls one Dice Block, while Bowser rolls four Bowser Dice Blocks by default, though certain events can cause him to have more or less available. If he does not roll a high enough number to catch Team Mario, he is given the option to reroll, though the option is only given once. If Bowser catches up to Team Mario, he forces them to play a randomly selected "Bowser Battle" minigame, where hearts are lost if the players are hit by his attacks. If Bowser depletes all of some players' hearts but other players are still standing, the eliminated players can get Special Dice Blocks for the remaining teammates to use. If Bowser depletes all of the hearts from all four players, he wins. Normally, the minigames are fairly easy for Team Mario, but Bowser can also become Angry and can play harder minigames if at least one member of Team Mario survives a minigame with all of their hearts intact, and can also become Furious and can select which minigame to play if "Big Bad Bowser Mode" is selected as a Homestretch! event. At the Homestretches of Mushroom Park and Whimsical Waters, Bowser Jr. appears with a roulette for Bowser to help him. In Chaos Castle's Homestretch, Bowser instead fuses the Bowser Dice Blocks into the Super Bowser Dice Block. He will then take his turn after each member of Team Mario; if he rolls his own icon, Bowser will immediately catch up to Team Mario. If Team Mario makes it to the goal, they face a challenge against Bowser Jr., in which he summons a normal enemy and a boss, and has Bowser hide the Super Star with him or one of the enemies. The player who reached the goal then guesses who has the star. If they guess correctly, they win, but an incorrect guess results in them being knocked back several spaces. Regardless of whether Bowser or Team Mario won, the camera subsequently focuses on the losing player(s). If Team Mario lost, the game displays the number of spaces Team Mario would have had to travel to reach the Super Star. In amiibo Party, players can scan a playable character's amiibo and play on small boards designed for that character with up to three other amiibo figurines. Players compete for the most stars, which can be bought by coins, similar to the gameplay in previous Mario Party games prior to Mario Party 9. CPUs or human players without amiibo are represented by cardboard cutouts instead of amiibo. Players who have amiibo can save and use tokens, which can affect gameplay. Players can also use character tokens to swap out a part of the board to the corresponding character board. Coin Challenge is a bonus game mode for 2-4 players. Rather than being found in the "Bonus Games" section, it is instead found in the Mario Party mode, at the very end of the game selection screen. Player compete to earn coins based off their minigame results in 3, 5, or 7 rounds of competition. The game starts with the characters competing in a minigame to earn coins based on their position. Each round, a minigame is picked from the minigame wheel that contains six random minigames. The minigame is picked randomly for the first round and by the last place player for subsequent rounds. If the difference between first and last is 30 coins or more at the start of a round, the minigame wheel spins slower, making selecting a specific minigame easier. One minigame equals one round, and at the end of each round, players will be able to see how many coins they earned in that minigame and how much they possess after each round, with the exception of the final round, where all there is in each coin counter are three ? marks. When playing a 5 or 7 round game, the last two rounds have two Chance Minigames; if one of them is selected, the players earn double the amount of coins normally earned in that round. Once 3, 5, or 7 minigames have been completed, depending on how many rounds the player has decided to play for, the game ends. The Rankings screen that shows after a Coin Challenge game is complete, showing each player's position and coin count. The players enter their colored pipes and the camera rises in height to each pipe corresponding to the ranking. Rankings are revealed from last to first based off who had the most or least coins in the game. If there is a tie for a position, the position in which no one takes that spot is skipped, and the characters that tie will exit the pipe next to each other, doing their respective poses simultaneously based on if they placed first or not. The number of coins that will come out of a pipe is based on the number of coins the player in that place had, and after the last coin comes out, the character will jump out of the pipe and do a victory animation (if placed 1st) or a failure animation (if placed outside 1st). Once the camera reaches the gold pipe and the character jumps out, the words "Congratulations!" appear on the screen; the music used for the result screen is shared with Minigame Tournament. The Ranking screen in this mode is displayed the same way as the Mario Party mode in a board and in amiibo Party mode, except that they lack Coin, Star or Mini Star symbols altogether and that the player labels that say P1, P2, etc. are merged closer to the character icon. The "View Details" button replaces the "View Graph" button from the other modes, and pressing that button changes the screen to another page that displays how many coins each player won in a specific round; if the respective minigame was a Chance Minigame, the values shown here will be twice as normal for that round. No matter how many rounds are set, 20 Mario Party Points are always awarded at the end of each Coin Challenge game. Players can also tap an amiibo to get bases and bonus Mario Party Points with a scratch card. However, only amiibo with Mario Party 10 data can earn bases, while others can only earn Mario Party Points. Once all of the bases are collected for an amiibo, the amiibo also gets scratch cards for the amiibo Bonus. Minigame Tournament is a bonus minigame in Mario Party 10 for up to eight players, the only mode in the game to allow that many players. Because only four Wii Remotes can be connected to the Wii U at once, pass and play is enforced when playing with five or more human players. The game starts with eight players divided into two groups of four. The first group consists of odd player numbers, and the second group consists of even player numbers. This is decided based on the order the characters are picked. The players in each respective group face off in a minigame, with first and second advancing to the next round and third and fourth being eliminated. If a minigame is only between CPU contestants, the minigame will be skipped and results will be simulated. Ties are always decided by dice rolls. Before a minigame begins, each player must grab the for their character and press the button to confirm. When playing with five or more human players, after the first group plays, the players who played that minigame must hand over the to the other players. After both groups have finished their minigames, the game moves on to the second round, and another minigame is played. Like with the first round, the top two players advance to the final round and the bottom two are eliminated. In the final round, the top two competitors must play one last minigame; the victor player then wins the tournament. Toad's Room is an extra mode, featuring a shop, a photo booth and a challenges mode. Shop: Players can buy unlockable characters, CPU Master Difficulty, vehicles for the boards, and music. Models of characters and backgrounds can be bought to be used in the Photo Booth. Challenge List: Players can see the challenges they completed and challenges yet to be completed. There are 49 challenges in all. Photo Studio: Players can take photos with the models of characters and backgrounds bought on the shop. One can also send their photos to Miiverse. Music: Players can listen to the songs bought on the shop. Staff credits: Players can view the Staff Credits here. Miiverse: This setting can only determine if Miiverse posts should be shown before starting a board game. When on, three posts will be shown on the loading screen. There are a total of thirteen playable characters in Mario Party 10. Of these characters, two (Rosalina and Spike) are playable for the first time in the series. Bowser is not playable in Mario Party mode, but is playable in other modes, and, despite previously being playable in Mario Party 4's Beach Volley Folly minigame, he is considered to be a new playable character. Toadette and Spike are unlockable through the Shop in Toad's Room. Also, Donkey Kong makes his first full playable appearance in the series since Mario Party 4. In addition, Toadette returns after being the first, and currently only, character to be in one numbered Mario Party installment, removed from a future numbered installment, and then re-added in a later numbered installment. The hero of the Mushroom Kingdom, Mario never hesitates to jump into action – especially when there’s a party happening! He may have spent his fair share of time in his brother Mario’s shadow, but Luigi’s never one to shy from the shining spotlight. This regal ruler of the Mushroom Kingdom always throws her crown into the ring when Mini-Stars are at stake! Loyal, lovable, lively: Toad’s list of qualities is longer than he is tall, and he’ll use every one of his abilities to come out on top. The green gobbler has attended every Mario Party to date, and Flutter Jumps back into the fun this time around. Driven by a greed for all things shiny and valuable, Wario can’t wait to get his hands on more Mini-Stars and Coins. Wild of moustache and every bit as devious as his accomplice Wario, the purple-garbed Waluigi returns for more mischief. Never one to turn down an invitation, this Sarasaland princess’s tomboyish streak stands her in good stead for the hustle and bustle of Mario Party. With all her experience in the Comet Observatory, Rosalina’s sure to have her eye on those Mini-Stars in her Mario Party debut. He’s finally back to kick some tail! After a break on the sidelines, the swinging king of the jungle is rolling out the barrel as a playable character once again. This character must be bought in Toad's Room with 600 Mario Party Points. *Use of the Bowser amiibo will cause his minigames to be played instead of the normal minigames. Bowser Spaces also will not cause negative effects on this amiibo. Note: Use of the golden edition Mario amiibo will turn the Mario figure that appears on the board into Gold Mario, although he is not present in the minigames. The same happens when the silver edition Mario amiibo is scanned, but with Silver Mario rather than Gold Mario. These are various minor NPCs that appear in boards and minigames. Appears as multiple board features in Whimsical Waters: one each in the Mario Party and Bowser Party modes. Appears as a background element in the Bowser Board. Appears as a board feature in Haunted Trail. Appears as a background element in the Luigi Board. Appears when the player lands on a Bowser Jr. Space. Appears as a board feature in the Bowser Board. Appears as the host of Bowser Party (for Bowser only) and Bowser Challenge. Appears when Team Mario lands on a Bowser Block +1 Space in Bowser Party mode. Appears as a selectable character when Team Mario attempts to get the Super Star in Bowser Party mode. Appears as a board feature in Airship Central. Appears as a board feature in Chaos Castle in Bowser Party mode only. Appears as a board feature in Chaos Castle. Appears as a board feature and a background element in Whimsical Waters in Mario Party mode only. Appears as a background element in Whimsical Waters. Appears as a board feature in Whimsical Waters. Appears as a background element in Mushroom Park. Appears as a background element in the Mario Board. Appears on a placard hanging from a dead tree in the Luigi Board. Appears when the player selects a Battle minigame on a Minigame Space. Appears as a spectator in various minigames. Appears as a background element in the Rosalina Board. Appears when Team Mario lands on a Bowser Block -1 Space in Bowser Party mode. Appears as a board feature in Mushroom Park. Appears as a board feature in the Peach Board. Appears as a background element in the Normal Board. Appears as a background element in the Yoshi Board. Appears as a board feature in Chaos Castle in Mario Party mode only. Appears as a background element in the Peach Board. Appears as a background element in the Toad Board. Colored members appear as hosts in Mario Party and Bowser Party (for Team Mario only). Appears as an audience that congratulates the player in Mario Party mode and Team Mario in Bowser Party mode. Appears at the first Gate Space of any given board in Bowser Party mode. Mario Party 10 features a grand total of 75 minigames, which is only slightly less than the 81 each in both Mario Party 9 and Mario Party: Island Tour. The minigame categories are much the same as in previous Mario Party installments: free-for-all minigames pit all four players against each other, 1 vs. 3 pits one player against the remaining three, and 2 vs. 2 pits two groups against one another. Boss minigames from Mario Party 9 also return with no changes to the basic formula; players compete against each other to defeat a boss. Yet also returning from Mario Party 9 are Bowser Jr. minigames, in which one player attempts to best Bowser Jr. in a wager for coins; however, only two of these minigames appear, and they are only fully playable in amiibo Party mode. A new category of minigames known as "Bowser Battles" are exclusive to Bowser Party mode, and involve Bowser attacking up to four other players in an attempt to deplete as many hearts as possible. Lastly, extra minigames are minigames which do not fit into any of the general categories and thus have their own sections in the Bonus Games; Badminton Bash and Jewel Drop are the only two extra minigames. Move forward (2, 3, 4) spaces. Hit the Dice Block again, and go back. Move back (2, 3, 4) spaces. Get haunted by a Boo! Make the Boo haunt someone else! Bowser Jr. will come and cause some trouble! Which way you go depends on the Cheep Cheep. Hit the Dice Block again, and advance. Get treasure from the Dragoneel! Stop and get some Dragoneel Treasure! A spin decides your fate! Do battle in a minigame! Only Bowser can see through the ink. Get a Special Dice Block! A homestretch event starts here! Trade 20 coins for a Star! The Boo will get scared of the light here and run away! If you pass here, everyone gets a Special Dice Block! Warp to another Warp Space! 1 - The player(s) must free Bowser by rolling all numbers on the Dice Block for this space to occupy existing spaces on the board. 2 - Only the +1 Bowser Dice Block Space appears on Mushroom Park; the -1 Space is absent. Mario Jump: All this does is change the movement sound? At least you can win with style! Luigi Jump: This just changes character movement? At least you can win with style! Bowser Jr.: Bowser Jr. gets in the way. For when you want to land on the same space again! Plus 1: Roll and move the number shown on the Dice Block, plus 1 additional space. 1-2-3 Dice Block: Only numbers 1, 2 and 3 appear. 4-5-6 Dice Block: Only numbers 4, 5 and 6 appear. Reverse Dice Block: You move in the opposite direction. Slow Dice Block: It's easier to hit the number you want. For when you really need to reach a certain space! Double Dice Block: You use two Dice Blocks. For when you need to get a move on! Bronze: A rare Token awarded for having collected all bronze Tokens. POW Block: You can steal coins from rivals by shaking things up with a POW Block. Pipe: All players change places via pipes! Bowser Space: Move to a Bowser Space. For when you really want to pick something up along the way! Plus 5: Roll and move the number shown on the Dice Block, plus 5 additional spaces. Silver: A rare Token awarded for having collected all silver Tokens. Dash Special: Roll 5 Normal Dice Blocks for a quick dash! Reverse Special: You can roll 5 Reverse Dice Blocks and move backward. Jump Special: Jump closer to a Star! Coin Special: Greatly increase the number of coins on the board. Star Special: Greatly increase the number of Stars on the board. Gold: A rare Token awarded for having collected all gold Tokens. Great work! Normal Board: You can play on the normal board. Mario Board: You can play on the Mario Board. Luigi Board: You can play on the Luigi Board. Peach Board: You can play on the Peach Board. Toad Board: You can play on the Toad Board. Yoshi Board: You can play on the Yoshi Board. Wario Board: You can play on the Wario Board. Rosalina Board: You can play on the Rosalina Board. Donkey Kong Board: You can play on the Donkey Kong Board. Bowser Board: You can play on the Bowser Board. Mario Party 10 received largely mixed reviews. Most criticism was directed towards the Mario Party mode as being too luck-based and the amiibo Party mode as being too bare-bones, though praise was directed towards the minigame varieties and the Bowser Party mode. It currently holds a score of 64.49% on GameRankings based on 47 reviews, and a score of 66 on Metacritic based on 66 reviews. Samuel Claiborn of IGN gave the game a 6.5/10, criticizing the return of the concepts from Mario Party 9, the board layouts in amiibo Party mode, and the game playing its target audience too safe, but was otherwise praising of the minigames and the Bowser Party mode, the latter of which he called "a blast", claiming "Whether you are Bowser or not, this five-person modification of Mario Party is [Mario Party] 10's greatest achievement – and one of the best uses of the Wii U GamePad yet." 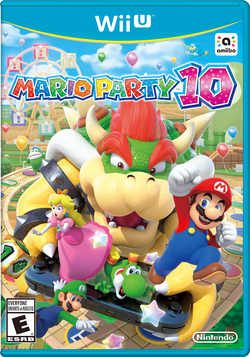 In a similar review, Mark Walton of GameSpot gave the game a 6/10, praising the visuals and the minigames, but criticized the amiibo Party boards, the overreliance on luck, and a poor implementation of the GamePad, stating "Ah, Mario Party, the game that, on paper at least, should be a rollicking good time filled with joyful minigames and all your favourite Nintendo characters. It's hard not be suckered in by that classic Nintendo charm, the bright colours, the jangly music, Mario yelling "it's-a-me!" If games were fun based on nostalgia value alone, then Mario Party 10 would be a wonderful creation. But they're not, and once you're over the sight of Mario and friends riding along in a Boo-inspired ghost train, the game's mildly amusing take on a family board game wears thin." Kirk McKeand of the Digital Spy was even more critical and gave it two out of five stars, praising only the concept of the Bowser Party mode and being critical of practically everything else, including the Mario Party and amiibo Party modes and some minigames he deemed "want[ing] to see what your wrist action is like". Wii U Samuel Claiborn, IGN 6.5/10 "After 17 years, Mario Party 10 needs more than GamePad antics and amiibo support to keep the party going." Wii U Mark Walton, GameSpot 6/10 "Despite the amiibo additions and GamePad Bowser games, as well as a delightfully bright and colourful aesthetic, it's hard to ignore just how similar this game is to its predecessors. But even if you could overlook it, the fact remains that even with some fun minigames in tow and a good group of friends to enjoy it with, Mario Party 10 just doesn't have the depth or the challenge to hold your attention for long." Wii U Kirk McKeand, Digital Spy 2/5 "When playing a good skill-based minigame it can be a blast, but these moments are far too fleeting. It's a fun game to stick on when you've got company round from time to time, but don't overdo it or it won't be long before people stop accepting your party invites." 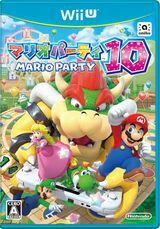 Mario Party 10 is the tenth best selling game for the Wii U with 1.94 million copies sold worldwide as of September 30, 2016. During the Nintendo Treehouse Event at E3 2014, it was claimed that Nabbit would appear to give Bowser extra dice blocks during Bowser Party. However, this was likely an early idea, as only Bowser Jr. gives Bowser extra dice, and Nabbit appears to take Dice Blocks away from Bowser. Also in the E3 demo of Mario Party 10, the characters used Mario Party 9 winning and losing animations. The fireballs in Bowser's Bad Breath had a different appearance. Additionally, the controls for Bowser in Bowser's High Dive were originally made to have the GamePad tilt left and right, though the final game instead uses the touch screen. Additionally, in an early gameplay of Bowser Party, the meter that showed the amount of spaces Bowser was from catching up with the Mario Team, and the bar that showed Team Mario's health both had a different appearance. For this subject's image gallery, see Gallery:Mario Party 10. Mario, Luigi, Peach and Yoshi. Key artwork for Bowser Party. Key artwork for amiibo Party. Mario Party 10 was developed by Nd Cube, the same development team who worked on Mario Party 9 and Mario Party: Island Tour. In addition, several staff members who previously developed Mario Party: Island Tour returned to develop Mario Party 10, including director Yukio Umematsu and composer Rei Kondoh. While Rosalina's former voice actress, Kerri Kane, was listed in the voice credits (misspelled as Kerry Kane), this was a mistake, as Laura Faye Smith provided the clips used in Mario Party 10. Several minigames have different names between the NTSC and PAL releases; for example, Found it? Pound it! is renamed "Grond Pound Prowl" in the PAL version. On the Western cover for the game, the Wii U GamePad Bowser is holding is black, matching the color for the Wii U Deluxe Set. On the Japanese cover, however, the GamePad is white, matching the color used for the Wii U Basic Set. Donkey Kong: Donkey Kong's sprite form from this game appears on his amiibo board. Super Mario Bros.: In the Mushroom Park board, sprites of Goombas and Koopa Troopas from this game appear as merry-go-round carriages. Additionally, Mario's amiibo Party theme is an arrangement of the Super Mario Bros. ground theme and Peach's sprite from this game appears in her amiibo board. The third theme for Chaos Castle contains an arrangement of the castle theme from this game. Super Mario Bros. 3: Toad's amiibo Party theme is an arrangement of the Toad House music from this game. After a Bowser Party is finished, the results music is the lullaby that makes the Hammer, Boomerang, Fire, and Sledge Bros. fall asleep. Wario Land series: The right half of the Wario amiibo board displays many elements from the Wario Land series, such as Wario's hard hat and the Wario Car. Also, Wario's amiibo Party theme is an arrangement of the Stonecarving City music from Wario Land: Shake It!. Donkey Kong Country series: Various elements from the series appear on Donkey Kong's amiibo board, including a Barrel Cannon, bananas, and a Mine Cart and rails. Also, Donkey Kong's amiibo Party theme is an arrangement of the Jungle Hijinxs music from Donkey Kong Country and Donkey Kong Country Returns. The sprite form of Donkey Kong is based on its cameo in Donkey Kong Country Returns, though it now lacks the Wii Remote it held in that game. Super Mario 64: Peach's amiibo Party theme is an arrangement of the Peach's Castle music from this game, and Bowser's amiibo Party theme is an arrangement of the "Bowser's Road" music from this game. Yoshi's Story: Yoshi's amiibo Party theme is an arrangement of music originating from this game. Donkey Kong 64: A verse from the DK Rap, originating from the said game, is used for Donkey Kong's description on the Mario Party 10 official website (see the description above, in the "Playable characters" section). WarioWare series: The left half of the Wario amiibo board features many elements from the WarioWare series, such as Wario's biker helmet and the Wario Bike. Luigi's Mansion: Luigi's amiibo Party theme is an arrangement of this game's main theme. New Super Mario Bros. series: The fortresses and castles on the boards are based on their appearance in the games from this series. Stone-Eyes and Nabbit return from New Super Mario Bros. U, the former in the minigame Fruit Scoot Scurry and the latter as an ally to Team Mario in Bowser Party. The airship design from this game also appears in the sky board. In the minigame Bowser's Tank Terror, Bowser falls in the lava which makes him reduced into Dry Bowser, resembles how he fell in the lava and reduced into his skeletal version in World 1-Castle of the first game of New Super Mario Bros. series. A few of the minigames take place in the worlds from New Super Mario Bros. U.
Mario Party 8: Donkey Kong's artwork is taken from this game. Super Mario Galaxy: Rosalina's amiibo board features several elements from this game and its sequel, including a Launch Star, Lumas, the red Starshroom, Star Bits, and several planetoids. Mario's voice when he falls off the stage is recycled from this game. Also, the entrance portals to any boss resemble black holes from this game. Additionally, Rosalina's amiibo Party theme is an arrangement of the Comet Observatory theme. Mario Kart 7: Daisy's artwork is taken from this game. Mario Party 9: The core gameplay mechanics in this game: Mini Stars and Mini Ztars, travelling around in a car, and fighting minibosses and bosses at the middle and end of the board return. Several animations and voice clips are reused, while others are new. Luigi's Mansion: Dark Moon: The Luigi amiibo board appears based on this game, having a model of the Gloomy Manor and a sign with a Greenie on it on the board. Mario Party: Island Tour: After a battle minigame or a boss battle in the event of a tie the player fights for the position with a Dice Block. Also, in Bowser Party the player has to roll a Dice to defeat the Whomp blocking the path. Super Mario 3D World: Many of the Bowser minigames are placed in World Bowser. Clear Pipes appear in the Minigame Tournament mode. Mario Party: Star Rush: Artwork and character animations are reused in this game. Mario Party: The Top 100: Several minigames from Mario Party 10 return in this game. Mario + Rabbids Kingdom Battle: Some of Luigi's animations are reused in this game. Super Mario Party: The majority of the returning characters' victory and losing animations are reused in this game. Mario Party 10 is the first game in the Mario Party series to be given a 7+ age rating by PEGI as opposed to a 3+ rating, although this game was provisionally rated 3+ when announced at E3 2014. During Bowser's turn in a Bowser Party, while he is moving toward the other players, pressing the button causes him to roar. ↑ GameRankings score for Mario Party 10. GameRankings. Retrieved August 15, 2018. ↑ Metacritic score for Mario Party 10. Metacritic. Retrieved August 15, 2018. ↑ Mario Party 10 Review. IGN. Retrieved August 15, 2018. ↑ Mario Party 10 Review. GameSpot. Retrieved August 15, 2018. ↑ Mario Party 10 review (Wii U): The fun is fleeting in this party game. Digital Spy. Retrieved August 15, 2018. This page was last edited on April 7, 2019, at 15:29.